It's not just a Platform Truck, it's a Tool! Our "4 Tools-in-One" design gives you the option of turning your Platform Truck into a Dolly, Panel Cart and an Inter-Connected multiple Dolly platform helping to move anything faster and safer. The Snap-Loc Platform Truck crushes all competitors platform trucks with its many unique features: 1,500 lb capacity with super heavy duty swivel casters allow you to move heavy loads with little effort. Caster brakes to firmly hold your load on hills. Patented 4 sided E-Strap attachment firmly holds cargo to Dolly frame allowing you to stack more without sacrificing safety or protection of cargo. The heavy duty steel bars are protected with a durable heat treated powder coat. Best of all, the Snap-Loc Dolly is Made in the USA! SNAP-LOC Push Cart Dolly, Black It's not just a Platform Truck, it's a Tool! Our "4 Tools-in-One" design gives you the option of turning your Platform Truck into a Dolly, Panel Cart and an Inter-Connected multiple Dolly platform helping to move anything faster and safer. 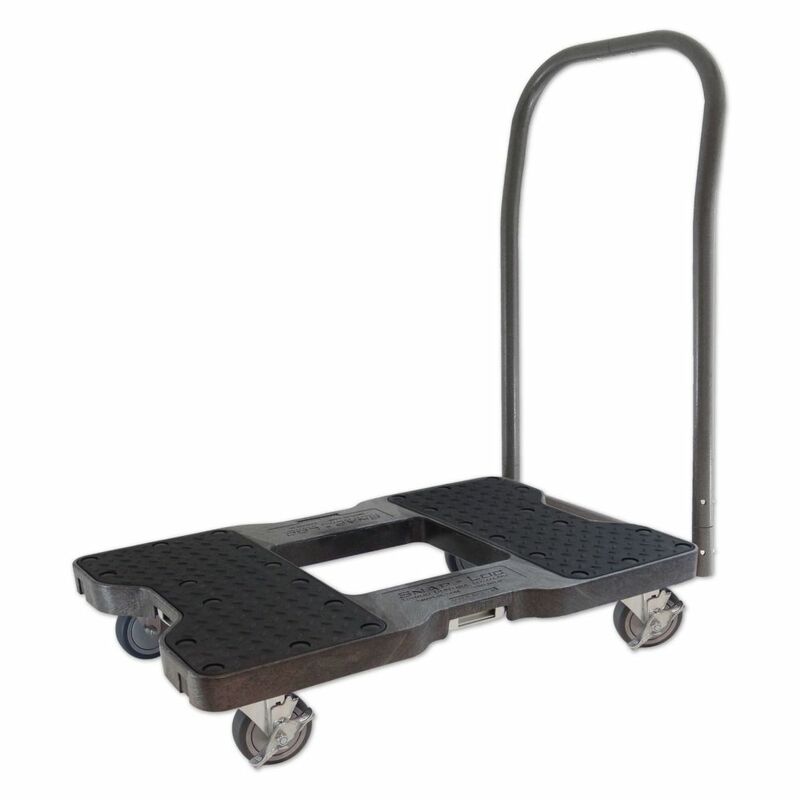 The Snap-Loc Platform Truck crushes all competitors platform trucks with its many unique features: 1,500 lb capacity with super heavy duty swivel casters allow you to move heavy loads with little effort. Caster brakes to firmly hold your load on hills. Patented 4 sided E-Strap attachment firmly holds cargo to Dolly frame allowing you to stack more without sacrificing safety or protection of cargo. The heavy duty steel bars are protected with a durable heat treated powder coat. Best of all, the Snap-Loc Dolly is Made in the USA! SNAP-LOC Push Cart Dolly, Black is rated 5.0 out of 5 by 1. Rated 5 out of 5 by JamesTKirk from Exceptionally well made product. Rolls smoothly and easily despite heavy loads. Highly recommen... Exceptionally well made product. Rolls smoothly and easily despite heavy loads. Highly recommended whether around the house or a work project.